How to claim EasyParcel Free Credit RM50 with EasyStore? You will get a RM 25 Free Credit once you signed up an EasyParcel Account. After fulfilling an order through the EasyParcel Integration app in your EasyStore, another RM 25 Free Credit will automatically credit to your EasyParcel Account within 24 hours. 3. 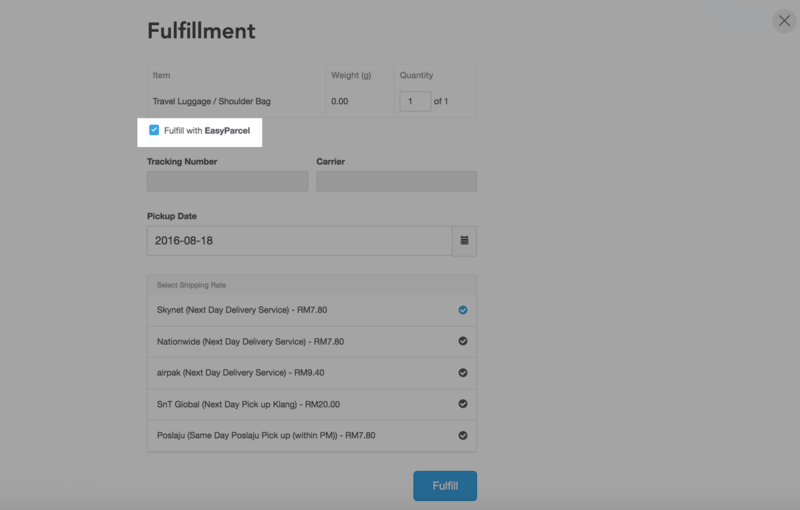 Log in to your EasyStore account, go to install the apps of EasyParcel Malaysia Rate and EasyParcel Fulfilment and getting integrated with EasyParcel. 4. Please select EasyParcel as your fulfillment channel for any order that you received in your online store. 5. Order is fulfilled successfully! EasyParcel will auto credit the RM 25 free credit to your EasyParcel account within 24 hours. 6. Congratulation! You have claimed the full amount of RM 50 from EasyParcel now! 1. What if I already owned an EasyParcel Account? No worries. You still reserve the chance to claim the RM 25 free credit once you fulfilled your order through the EasyParcel Integration app with EasyStore. 2. What if I already owned an EasyStore Account? You are qualified to claim the full amount of RM 50 free credit from EasyParcel once you signed up an account with EasyParcel and fulfilled your order through the EasyParcel Integration app with EasyStore. a. RM 25 credit is only available for the first successful order that fulfilled through EasyParcel without cancellation. b. EasyParcel & EasyStore reserved the right to change or amend any terms and conditions from time to time without prior notice. c. If you didn’t receive your RM 25 free credit after fulfilling the order through EasyStore, please contact support@easyparcel.my.